Sometimes, purchasing furniture “off the floor” is just not going to cut it. It might be because the rooms you are trying to furnish are overly large, overly small, or oddly-shaped, but when this is the case, pulling a room together can be a daunting endeavor. Choosing custom furniture can help you take advantage of unique materials and design aesthetics, delivering an artfully crafted, heirloom-quality result that will really pop. As some of Houston’s most respected artisans and craftspeople, we ensure the best possible results. All of our custom-built furniture is handcrafted at our Houston facility, leveraging modern technology, top-notch joinery, and hand-crafted finishing techniques to complete your piece. Quality such as this simply cannot be found in factory-made furnishings. Each piece is one-of-a-kind and unique to you, meaning that you will not see an item just like yours anywhere. We approach each job with meticulous care and attention to detail, ensuring the integrity of the final product along with your complete satisfaction. Coffee tables are more than just functional – they can be art as well. Using stunning, richly-grained rare woods, live-edges, or sophisticated modern veneers, we can create something for you that is absolutely stunning. For more challenging spaces, we can also create multi-purpose tables that integrate storage or even variable heights. A combination table such as this can make the most of your room while offering practical and space-saving solutions to suit your lifestyle. There is nothing like having your entire family around the table at the holidays or when celebrating a milestone. A custom dining table can be built to your specifications, giving your loved ones a special place to gather and share joy. Rare and custom woods, variable sizes, and even trees from your property can be used to create something truly spectacular. In many cases, the home office is tucked away on a landing or in an out-of-the-way space that was not originally intended for such a use. To maximize the space options you have, custom-built office furniture is the answer. We start with scale drawings of your home office, incorporating your design ideas and practical needs into our rendering. We consider the interior design of the rest of your home, providing you with a seamless result that will look like it was there all along. Once the design is approved, we will work with you to choose the materials, finishes, and features that are going to take it over the top. We use only the finest quality in our custom work. What that means to you is that everything we make is built to last. Trends come and go, styles change. To make sure you will enjoy your custom furniture for generations to come, we focus on classic styling so that you will always love the look and feel of your custom-built items. One of Jim Farris Cabinets’ greatest differentiators is that we are 100 percent committed to your satisfaction. To that end, we leverage a design-build philosophy, which brings together all stakeholders with one common goal: to provide an end result that is as satisfying as it is beautiful and as practical as it is value-driven. As a design-build firm, we know that addressing concerns prior to beginning the job will result in economy, minimizing waste and delays in the journey towards the end result. We bring all the necessary artisans, designers, and engineers on board right from the start, developing a team that is single-minded in its purpose and fully dedicated to realizing your vision. 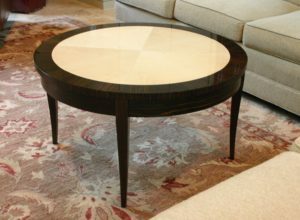 In terms of custom furniture, a design-build approach is essential, because your piece needs to be everything you imagined, and more. Your voice is as important as any other on the team and we will always solicit your thoughts prior to commencing the work. Whether you need something as simple as an entryway bench and coat rack or an heirloom-quality table for you dining room, custom furniture is well within reach. Call today to learn more or browse our custom furniture gallery for inspiration.